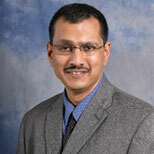 He did his Internal Medicine residency at St Francis Hospital in Illinois and was Chief Resident (1993-1994). Followed by Pulmonary/Critical Care fellowship at Baylor College of Medicine in Houston. Dr. Iyer is an active medical staff member at these following hospitals: Clear Lake Regional Medical Center, Christus St John Hospital, Kindred Hospital, Cornerstone Hospital and Kindred Rehab Hospital. He has held many different staff appointments at these hospitals.